I remember as a kid the excitement I felt at the start of fall. I loved jumping in huge piles of freshly raked leaves and taking in every moment of outside play I could before the snow of winter blew in. Every year I hunted for the ideal pumpkin to carve. I liked one that was tall and skinny, like me. And, like every other kid in the neighborhood, I wanted to have the biggest pumpkin on the block. 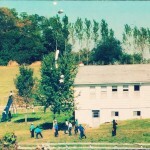 Our recent visit to Pinter’s Gardens & Pumpkins near Decorah, Iowa took me back to those days. A barn near the petting zoo at Pinter’s. 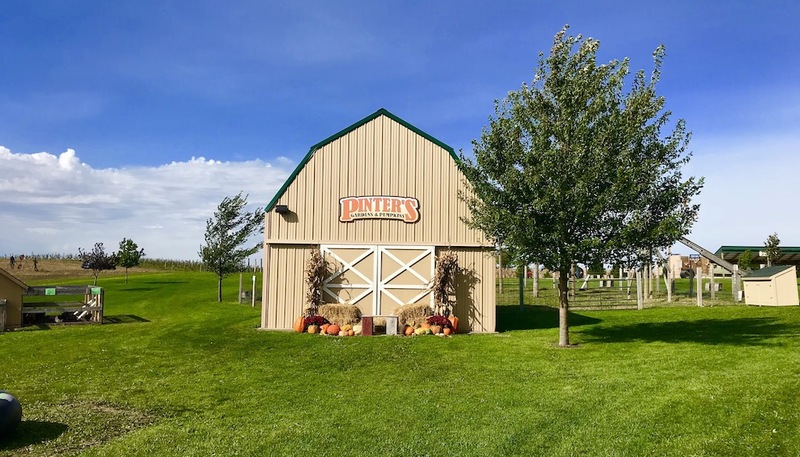 We had the chance to visit Pinter’s on a crisp, early fall morning. We pulled into the lot and parked next to a lone school bus. Climbing out of the car I inhaled deeply, savoring the fresh Iowa farm air while listening to the joyful sounds of children playing in the distance. 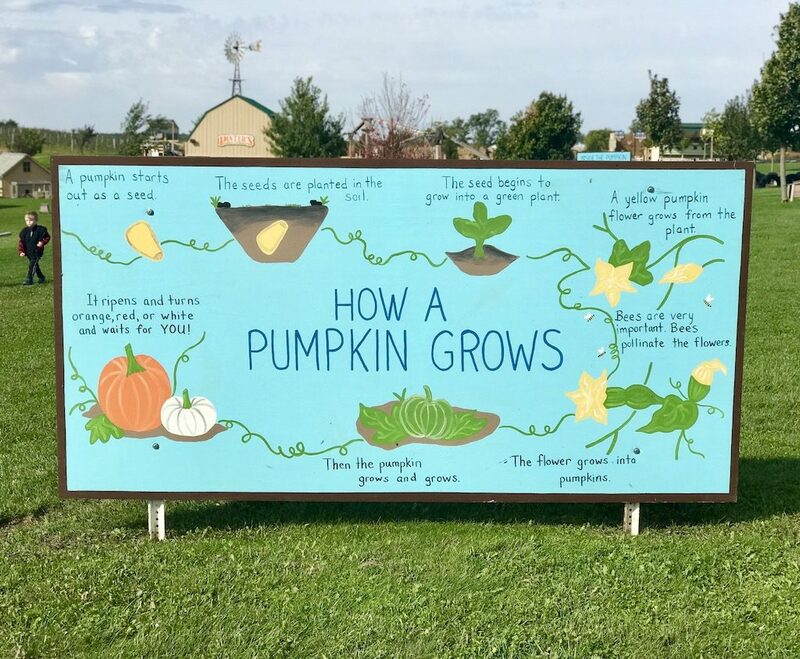 The pumpkin patch is open to the public on weekends; we were there for a private tour on a weekday when it was only open by appointment. This meant, of course, that I’d have a chance to play like a kid without embarrassing myself around other adults. When we walked in the front door, owner Elisa Pinter greeted us and offered to take us on a tour of the grounds. 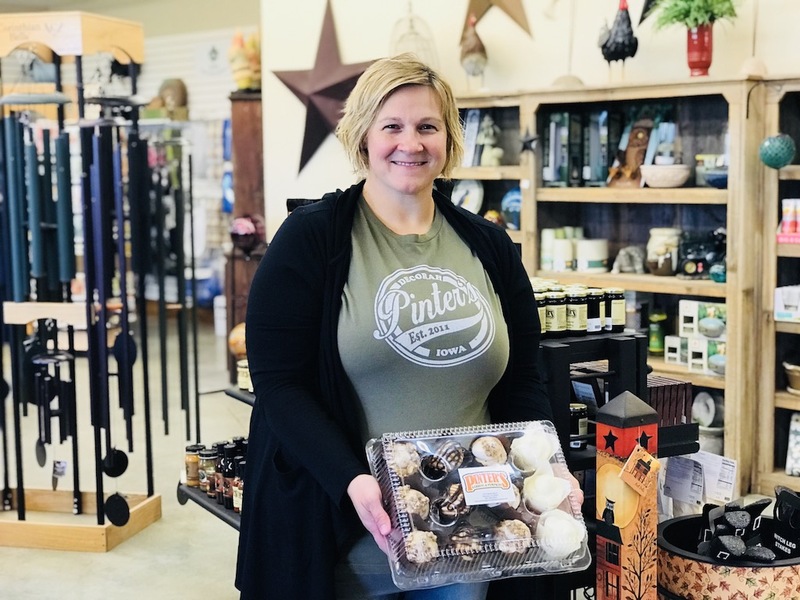 Owner Elisa Pinter holds a box of their delicious cupcakes. After trying one, we know why these famous cupcakes are a favorite among locals. 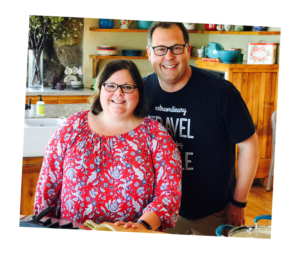 We quickly learned that this business is a labor of love for the Pinters and they have worked very hard to grow their dream into reality over the last seven years. Elisa led us outside to a large area filled with fun activities for the whole family while explaining a little more about the business. The Pinters have a garden center that is open year-round, and the family has done landscaping in northeast Iowa since 1998. 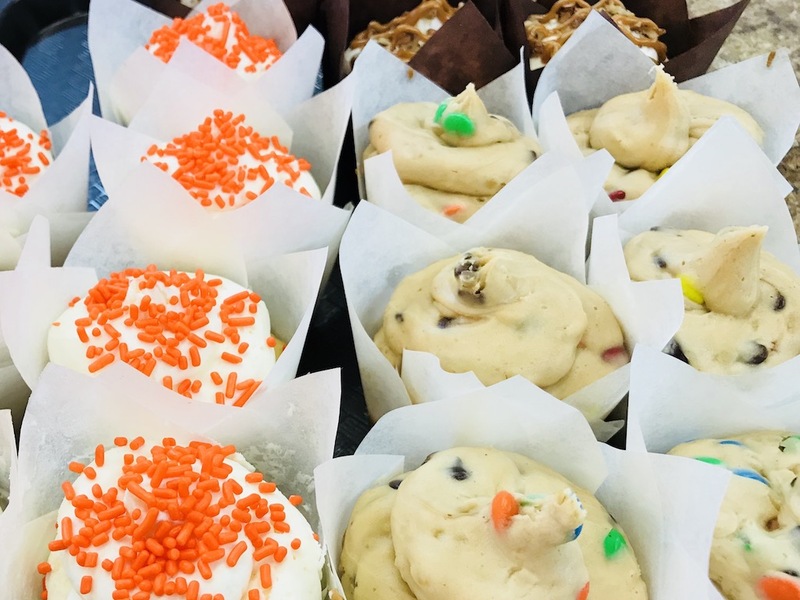 In addition, they have a bakery and candy shop that are open year round that offers freshly made treats like homemade fudge, pies, and flavored popcorn. 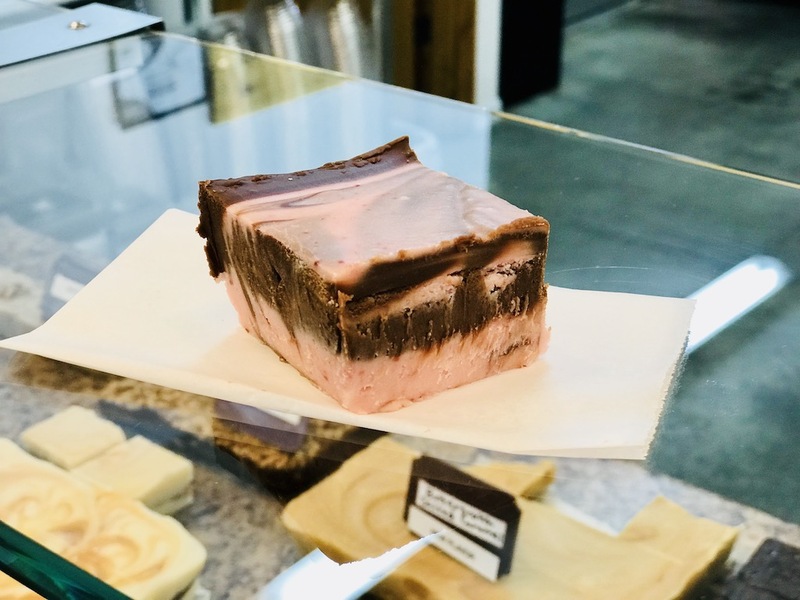 The fresh fudge at Pinter’s is worth a trip by itself. They pop and bag their own popcorn right on site! Flavors available include buttered, cheese, caramel, green apple, and kettle corn. Elisa told us the bakery is best known for its cupcakes. One taste of these moist delights and we understood why Pinter’s cupcakes are famous all over the region. Ann loved the pumpkin cupcake, while I enjoyed the monster cookie cupcake. In all honesty, I wanted to eat about 10 of them. An up-close look at some of the delicious cupcakes at Pinter’s. On the left are their famous pumpkin cupcakes, while on the right are monster cookie cupcakes. And yes, they taste even better than they look! On weekends, Pinter’s Gardens & Pumpkins also offers fresh wood-fired pizzas so visitors can easily spend a whole day there and have something hearty along with the sweet treats. Starting the last two weekends in September and running every weekend through October, Pinter’s opens their famous pumpkin patch. Whether it’s learning about where food comes from or improving motor skills by playing outside, education is at the heart of everything they do. 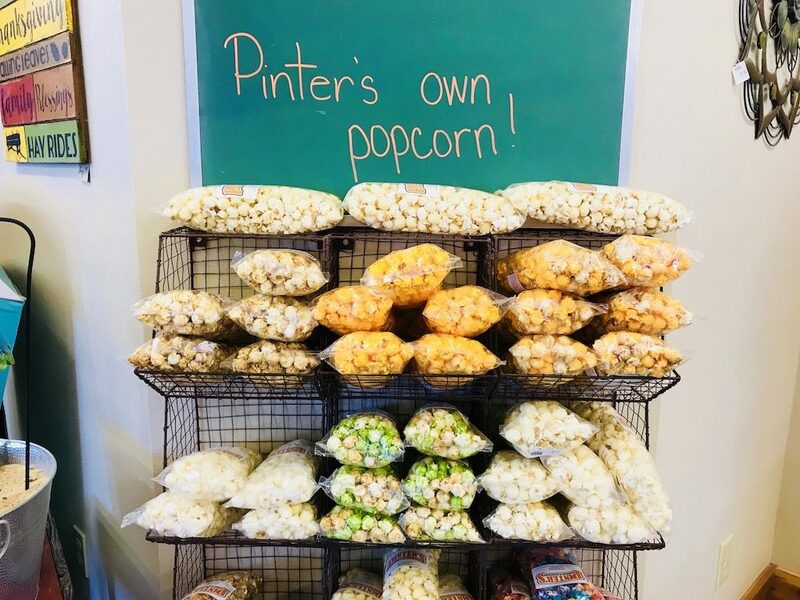 Pinter’s not only provides fun for the whole family, they also provide education about their farm and the products available on it. A number of activities also teach problem solving skills. 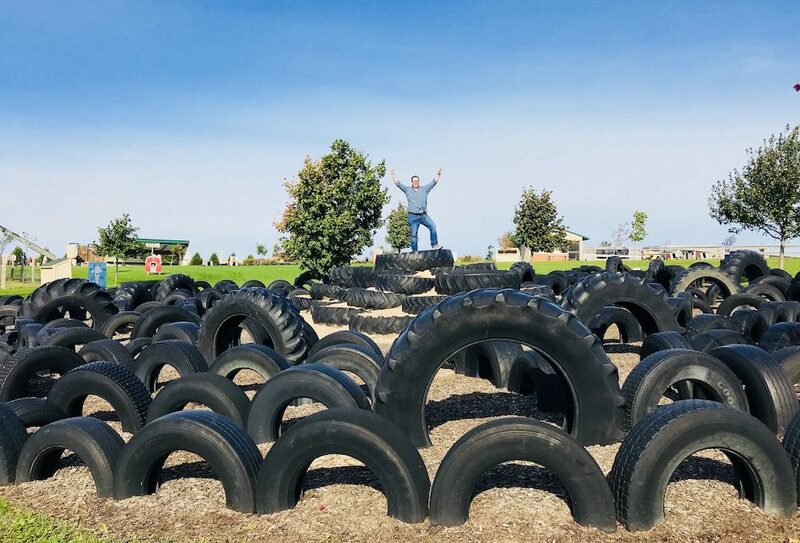 Children can first try their luck at a tire maze where it’s easy to get un-lost before setting off into a much more complicated corn maze where whole families can try the adventure together. Steve climbs on top of the tires and declares himself king of the hill at Pinter’s. 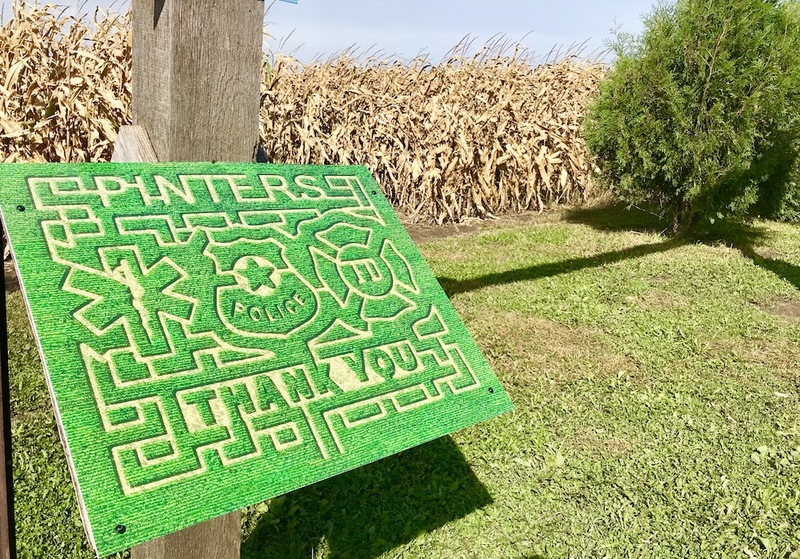 The corn maze at Pinter’s looks pretty complicated from here. We can only imagine what it would be like on the inside. 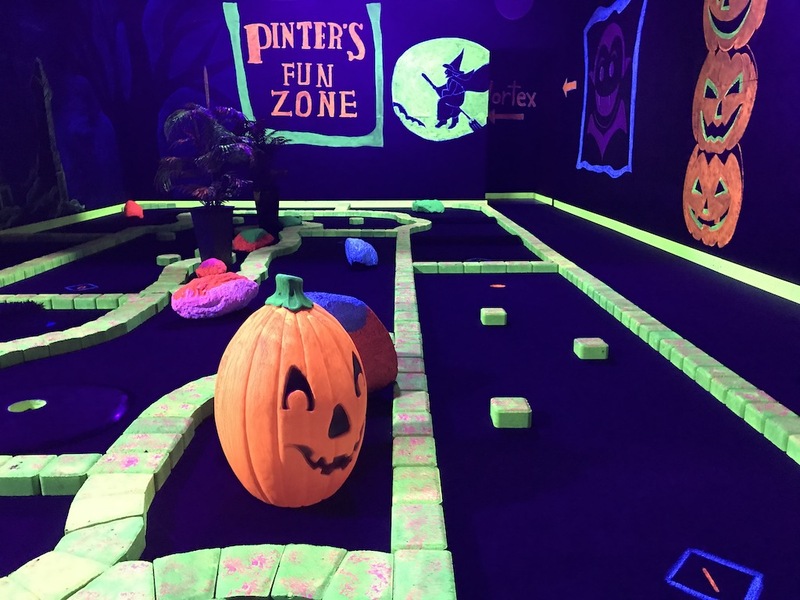 Kids of all ages can throw passes and pitches in the ball zone, play in a giant sand box, walk through a fun house, or play glow-in-the-dark mini golf. New in 2018 is indoor, glow-in-the-dark mini golf. It’s a fun challenge, indeed! In addition, Pinter’s offers a petting zoo with goats, chickens, ducks and turkeys. They also have tetherball, a pumpkin cannon (yes, you read that right), pumpkin bowling, bocce ball, as well as giant checkers and chess. 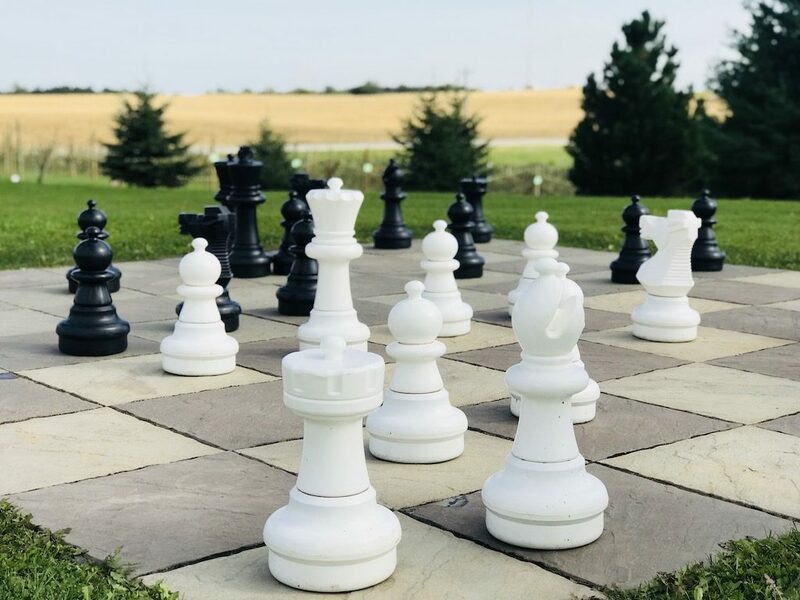 A huge chess board is one of the many outdoor activities at Pinter’s. We really enjoyed our time at Pinter’s Gardens & Pumpkins and can’t thank Elisa and her staff enough for their hospitality. Seeing the wide varieties of freshly picked pumpkins, hearing the laughter of children as they played, and smelling the freshly baked cupcakes as they came out of the oven took me back to a wonderful place in my childhood. It will take you there, too. Thanks to Charlene Selbee for arranging this tour and to Pinter’s Pumpkins & Gardens for the delicious cupcakes. The opinions expressed are our own.